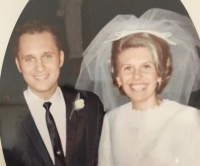 Dan and Pat Evasink of Barrington celebrated their 50th wedding anniversary on January 25, 2019. They have two lucky daughters and sons-in-law, Amy (Tim) Evans of Victor, Idaho, and Susie (Matt) Talbott of Champaign, Illinois, who find their love, patience, generosity, and humor inspiring. Their five grandchildren (Anna, Ivan, Eli, Ben, and Max) love them dearly for their french toast sticks, billiard lessons, and great adventures. Happy anniversary, lovebirds! You make everything in our world better.